The optimal resuscitation of a pediatric trauma patient presents unique challenges and age-specific issues that do not exist in the adult population. Care providers must use similar, but in some cases very different strategies to appropriately resuscitate a pediatric trauma patient. Specifically, unique approaches to vascular access, fluid management, and blood transfusion should be considered. Obtaining vascular access in a pediatric trauma patient offers unique challenges. These issues include obtaining the cooperativeness of the child for IV placement, potential for psychological trauma, smaller veins, and more subcutaneous fat in children making both palpating and visualizing veins more difficult. When considering IV placement in a pediatric trauma patient, additional issues such as higher likelihood of hypovolemia upon presentation,  lower success rates of IVs by first responders  with consequent hematomas, bruises, and non-availability of these punctured veins for IV placement, fractures in the extremity bones, and hypothermia causing peripheral vasoconstriction, the challenge becomes even more difficult. Flow of fluids through intravenous catheters is governed by the Hagen-Poiseuille equation which characterizes the flow through a long cylindrical pipe [Figure 1]. 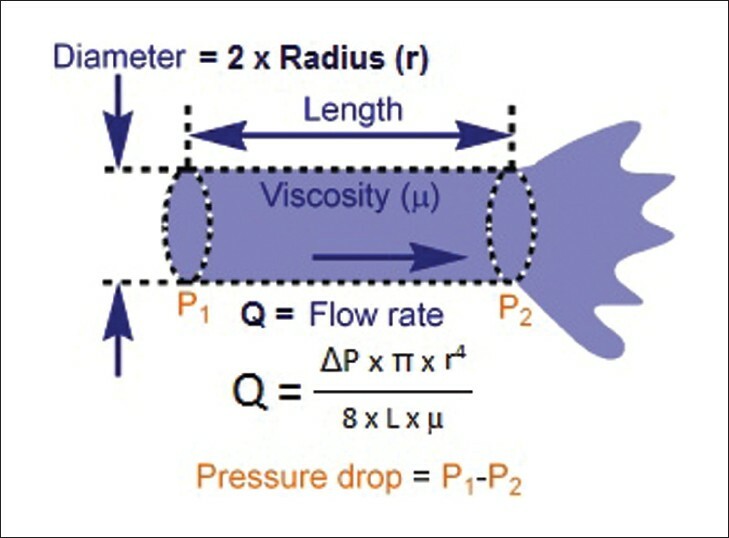 Flow is inversely proportional to the length of tubing, viscosity of fluid, proportional to the pressure drop across the IV catheter, and proportional to the fourth power of the radius of the IV catheter. 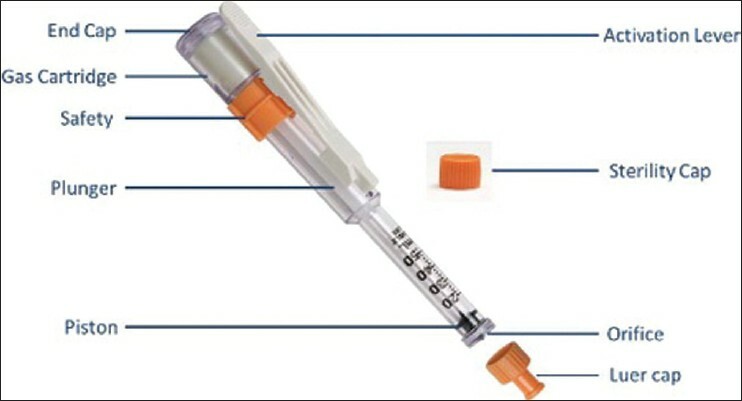 Maximum flow rates for each IV catheter are published and written on the package of each IV. The values from BD© (Franklin Lakes, NJ), a common IV catheter manufacturer in the US, are shown in [Table 1]. These values generally correspond with flows when using an IV under normal conditions as using a rapid infusion system can result in higher values. Rapid infusion systems increase the pressure drop across the IV catheter and increase the temperature of the infusate which effectively decreases viscosity to allow for greater flow rates. Size and length of intravenous catheters must be considered in pediatric trauma patients. Even within the pediatric population, what would be considered a "small catheter" for a teenager would be considered a "volume line" for an infant. It has been reported that using a rapid infusion system and an 8.5 French central line in an adult, one can achieve flow rates of approximately 850 ml/min. For a 70-kg male, this would result in replacing his normal circulating blood volume in just under 6 minutes. To achieve replacement of one circulating volume in the same time in a 20-kg 7-year old, one could use two 20 gauge IVs with a rapid infusion system. To have the same capability in a 5-kg infant, one could use one 22 gauge IV and a 10 cc syringe as a pump. In a pediatric trauma resuscitation, IV access that can be placed most easily with the lowest rate of immediate life-threatening complications would be the femoral vein line. Femoral line placement can be aided by the use of ultrasound [Figure 5], but can also be placed based on landmarks as the femoral vein runs through the groin just medial to the femoral artery which can usually be detected by a palpable pulse. The presence of serious abdominal or pelvic trauma with suspected injury to the IVC is a contraindication for a femoral line, and clinicians should strongly consider subclavian or internal jugular vein access in these patients. Common complications associated with these lines include higher risks of pneumothorax. The presence of unilateral pneumothorax, if already treated with chest tube, should direct a clinician to place central access on the same side as the child would already be treated for this complication. The goal of resuscitation in trauma victims is to provide adequate oxygen delivery to vital organs and prevent shock. Inadequate volume resuscitation (when combined with inadequate IV access) has been shown to be the leading cause of preventable trauma-related mortality in children in a recent study. Recognizing shock in the pediatric trauma patient can be more difficult as the signs of shock can be more subtle than in adult patients. A child that appears only as irritable initially may have lost as much as 30% of his or her blood volume [Table 2]. Rapidity with which children can get hypovolemic should not be underestimated and hence PIV access with two age-appropriate IV cannulae should be achieved in all polytrauma patients. Clinically, it is useful to separate shock into three clinical categories: compensated shock, decompensated shock, and cardiopulmonary failure in order to prioritize the resuscitation strategies [Table 2]. A quick physical exam can provide vital information which should lead to appropriate treatment thereafter. Key elements of this exam will include assessing heart rate, presence and strength of pulses, blood pressure, respiratory rate, mental status, color and temperature of extremities, and capillary refill. Tracking urinary output and blood pH can help provide guidance with further resuscitation efforts, although these variables are not always available on immediate assessment. While every child is different and presents with his or her own unique issues, most trauma centers apply simple algorithms to treat pediatric trauma patients. A clinician must continue to reassess vital signs and objective laboratory parameters to guide volume replacement and deviate from the published standards if situation demands. ATLS, a program created and developed by the American College of Surgeons, has developed such guidelines in taking care of the pediatric trauma patient. According to ATLS practice, when a child presents in shock, after adequate IV/IO access is established, if there are any signs of inadequate tissue perfusion, administer a rapid (<20 minutes) bolus of 20 cc/kg of lactated Ringer's solution or 0.9% saline solution. If there are continued signs of inadequate perfusion after the bolus is completed, ATLS suggests a second rapid infusion of 20 cc/kg of lactated Ringer's solution or 0.9% saline solution. If there are still signs of inadequate tissue perfusion after a second bolus, a third one is suggested, but at this point, one should also start to consider using blood products for resuscitation, especially if the blood loss is suspected to be ongoing. Particularly in younger children of smaller weights, a buretrol is highly recommended to prevent over-resuscitation of a child. The management of glucose levels in these patients is a topic that has not been examined closely in the literature, but one study suggests that glucose levels are abnormal 77% of the time. For this reason, blood glucose should be closely monitored in pediatric patients to prevent hypoglycemia, especially those under 6 months of age. Glucose should be kept out of resuscitative fluid to prevent hyperglycemia, but routinely monitored, and hyperglycemia should be treated in high-risk groups such as traumatic brain injury patients. Hyperglycemia has also been associated with increased risk of infection and increased length of stay  in pediatric trauma patients suggesting that the control of hyperglycemia may lead to better patient outcomes. In the pediatric trauma patient with suspected or known traumatic brain injury, additional treatment goals center around preventing secondary brain injury, maintaining adequate cerebral perfusion pressure, and keeping intracranial pressure low. In addition to maintaining an adequate circulating volume, appropriate fluid management also includes appropriately using hyperosmolar therapy (mannitol, hypertonic saline) when indicated. Because maintaining normal intracranial pressure is a primary goal in managing these patients, hypovolemia and hypervolemia must be avoided. While trauma care does not stop after the initial resuscitation, careful attention needs to be applied to the fluid management of these patients after an initial resuscitation to help prevent further secondary iatrogenic injuries and maintain adequate perfusion throughout the acute phase of recovery. The "4-2-1 rule" is what is most commonly used and practiced when estimating maintenance requirements for pediatric (and some adult) patients. The rule recommends 4 cc/kg/h for a patient up to 10 kg. For patients between 10 and 20 kg, the rule establishes 40 cc/hr + 2 cc/kg/h (for every kg above 10 kg), and 60 cc/h + 1 cc/kg/h (for every kg above 20 kg) in patients greater than 20 kg. This rule is purely a guideline and should not be used in all patients, but rather as a starting point for maintaining fluid management in the trauma patient. In patients who have more severe injuries or patients who do not respond to initial IV crystalloid boluses, the use of blood products should be strongly considered as the primary resuscitative fluid until hemorrhage can be controlled. While whole blood might be an ideal fluid to transfuse in the trauma patient, it is not readily available in all countries and situations. Transfusing individual blood products remains the standard of care in pediatric trauma resuscitation mainly because this is what is available from blood centers. ATLS recommends considering transfusion if a patient still has signs of shock after two boluses of 20 cc/kg of a crystalloid have been administered [Figure 6]. The decision to transfuse blood products is not one that should be taken lightly, as transfusion of stored packed red blood cells may have deleterious side effects on oxygen delivery , and has in some populations of pediatric patients been associated with increased mortality, prolonged use of mechanical ventilation, and increased length of ICU stay. It can also be difficult to determine how much blood loss has occurred when a patient has arrived making the decision more difficult. While laboratory analysis such as serial hematocrits, lactate, and base deficit may prove useful to help guide fluid and blood product administration, there are no clear hemoglobin thresholds for pediatric patients other than those extrapolated from studies looking at adult outcomes. Additionally, laboratory analysis can take time and it can be difficult in the acute resuscitative period to obtain samples that will be reflective of accurate hematologic values for that patient at that point in time. When time allows a clinician to measure individual parameters associated with each blood product (hematocrit, PT/INR, platelets, fibrinogen, or other complex methods such as thromboelastography), transfusion can be directed toward objective laboratory values. These laboratory values will vary by age and the age-specific average should be considered when titrating blood products to laboratory values. Additionally, the blood bank should be notified when a pediatric trauma patient is less than 4 months of age so that these patients can preferentially receive blood that has been recently collected, freshly irradiated, and is "CMV-safe." If time cannot be allowed for delivery of such blood, using the emergency uncrossmatched O-negative blood until the appropriate units can be delivered is a better alternative than delaying transfusion in such a patient. In clinical situations when there is not sufficient time or it is not feasible to wait for laboratory tests to guide therapy, using an empiric approach to blood transfusion must be employed. While there is no clear answer about which empiric approach to take in adults regarding ratios of packed red blood cells, fresh frozen plasma, platelets, and cryoprecipitate, it is clear that all of these products should be used in a massive transfusion protocol. Dosing blood products is traditionally weight based and when an accurate weight cannot be measured, using a length-based resuscitation tape [Figure 7] can help estimate the weight. 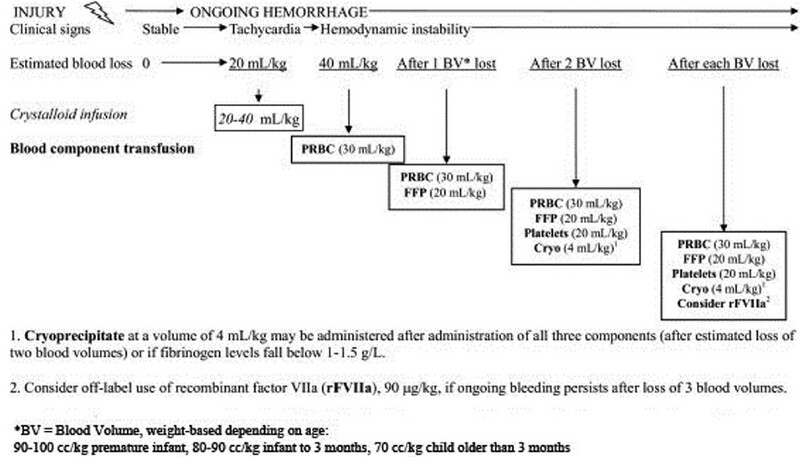 One transfusion protocol has been recently proposed for children less than 30 kg [Figure 8], which also suggests use of recombinant Factor VIIa in cases where multiple blood volumes have been lost. This recommendation is based on several case reports where rFVIIa has been successfully used outside of its FDA-approved indications, and doses administered have ranged from 20 to 180 mcg/kg. Before its routine use can be recommended in children, more studies should be undertaken to look at the potential complications, specifically in children, of administering rFVIIa, but its potential benefit cannot be debated. Under-resuscitation could lead to multiple-organ dysfunction, with the kidney and liver being the most susceptible organs. Procedure-related complications for IO and central access include, but are not limited to, extravasation, infection, pneumothorax, and perforation of the heart. Over-resuscitation can lead to pulmonary and/or peripheral edema, especially in children with pre-existing cardiac or renal disease. Children must be monitored for common complications of blood transfusion including hyperkalemia, hypocalcemia, and hypothermia (if blood products are not sufficiently warmed during transfusion). Additionally, other potential iatrogenic complications include hypothermia, air embolism, transfusion reactions when blood products are used, and subcutaneous infiltration of IV fluid. Some of these complications can be severe enough to be life threatening on their own. The key to excellent trauma care starts with good preparation, rapid assessment, re-assessment, team communication, and close monitoring throughout the acute phase of traumatic injury. Using appropriate methods in establishing IV/IO access, fluid management, and blood transfusion is an integral part of providing quality care for pediatric trauma patients. 1. Bankole S, Asuncion A, Ross S, Aghai Z, Nollah L, Echols H, et al. First responder performance in pediatric trauma: a comparison with an adult cohort. Pediatr Crit Care Med 2011;12:e166-70. 2. Idris AH, Melker RJ. High-flow sheaths for pediatric fluid resuscitation: a comparison of flow rates with standard pediatric catheters. Pediatr Emerg Care 1992;8:119-22. 3. Barcelona SL, Vilich F, Cote CJ. A comparison of flow rates and warming capabilities of the Level 1 and Rapid Infusion System with various-size intravenous catheters. Anesth Analg 2003;97:358-63, table of contents. 4. Gibbs N, Murphy T, Campbell R. Maximum transfusion rates in neonates and infants. Anaesth Intensive Care 1986;14:347-9. 5. Lenhardt R, Seybold T, Kimberger O, Stoiser B, Sessler DI. Local warming and insertion of peripheral venous cannulas: single blinded prospective randomised controlled trial and single blinded randomised crossover trial. BMJ 2002;325:409-10. 6. Bellotti GA, Bedford RF, Arnold WP. Fiberoptic transillumination for intravenous cannulation under general anesthesia. Anesth Analg 1981;60:348-51. 7. Teillol-Foo WL, Kassab JY. Topical glyceryl trinitrate and eutectic mixture of local anaesthetics in children. A randomised controlled trial on choice of site and ease of venous cannulation. Anaesthesia 1991;46:881-4. 8. Kim DK, Choi SW, Kwak YH. The effect of SonoPrep(R) on EMLA(R) cream application for pain relief prior to intravenous cannulation. Eur J Pediatr 2012;171:985-8. 9. Ehrenstrom Reiz GM, Reiz SL. EMLA-a eutectic mixture of local anaesthetics for topical anaesthesia. Acta Anaesthesiol Scand 1982;26:596-8. 10. Browne J, Awad I, Plant R, McAdoo J, Shorten G. Topical amethocaine (Ametop) is superior to EMLA for intravenous cannulation. Eutectic mixture of local anesthetics. Can J Anaesth 1999;46:1014-8. 11. Jimenez N, Bradford H, Seidel KD, Sousa M, Lynn AM. A comparison of a needle-free injection system for local anesthesia versus EMLA for intravenous catheter insertion in the pediatric patient. Anesth Analg 2006;102:411-4. 12. Haas NA. Clinical review: vascular access for fluid infusion in children. Crit Care 2004;8:478-84. 13. Graupman P. Using the superior sagittal sinus for emergency venous access in an infant. Case report. J Neurosurg 2006;104(3 Suppl):195-6. 14. 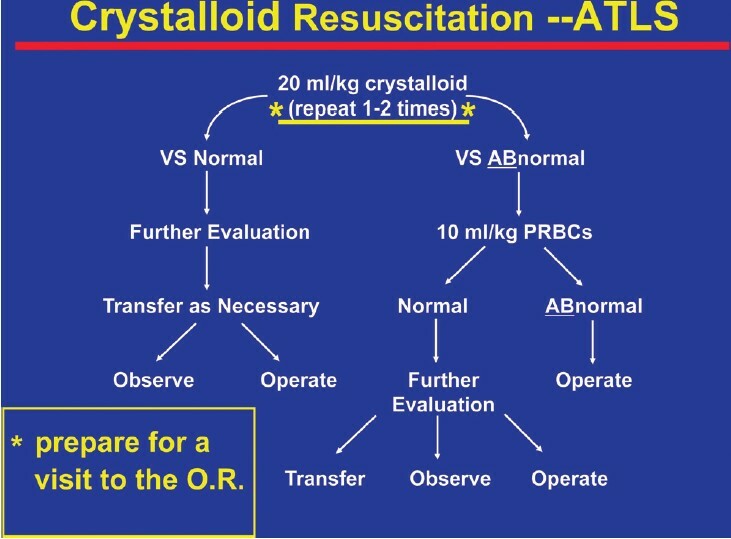 Sharar SR, Ramaiah R. Essentials of Trauma Anesthesia. Cambridge: Cambridge University Press; 2012. 15. Abe KK, Blum GT, Yamamoto LG. Intraosseous is faster and easier than umbilical venous catheterization in newborn emergency vascular access models. Am J Emerg Med 2000;18:126-9. 16. Glaeser PW, Losek JD. Emergency intraosseous infusions in children. Am J Emerg Med 1986;4:34-6. 17. Mackway-Jones K, Advanced Life Support Group (Manchester England). Advanced paediatric life support: The practical approach. 3rd ed. London: BMJ; 2001. 18. Horton MA, Beamer C. Powered intraosseous insertion provides safe and effective vascular access for pediatric emergency patients. Pediatr Emerg Care 2008;24:347-50. 19. Nagler J, Krauss B. Videos in clinical medicine. Intraosseous catheter placement in children. N Engl J Med 2011;364:e14. 20. Ngo AS, Oh JJ, Chen Y, Yong D, Ong ME. Intraosseous vascular access in adults using the EZ-IO in an emergency department. Int J Emerg Med 2009;2:155-60. 21. Hodge D, 3rd, Delgado-Paredes C, Fleisher G. Intraosseous infusion flow rates in hypovolemic "pediatric" dogs. Ann Emerg Med 1987;16:305-7. 22. Iserson KV, Criss EA. Pediatric venous cutdowns: utility in emergency situations. Pediatr Emerg Care 1986;2:231-4. 23. Dronen SC, Yee AS, Tomlanovich MC. Proximal saphenous vein cutdown. Ann Emerg Med 1981;10:328-30. 24. Esposito TJ, Sanddal ND, Dean JM, Hansen JD, Reynolds SA, Battan K. Analysis of preventable pediatric trauma deaths and inappropriate trauma care in Montana. J Trauma 1999;47:243-51; discussion 51-3. 25. Keller MS, Coln CE, Trimble JA, Green MC, Weber TR. The utility of routine trauma laboratories in pediatric trauma resuscitations. Am J Surg 2004;188:671-8. 26. American Academy of Pediatrics., Chameides L, Hazinski MF, American Heart Association. Textbook of pediatric advanced life support. Dallas, Tex. : American Heart Association; 2011. 27. Tuggle DW, Kuhn MA, Jones SK, Garza JJ, Skinner S. Hyperglycemia and infections in pediatric trauma patients. Am Surg 2008;74:195-8. 28. Bailey AG, McNaull PP, Jooste E, Tuchman JB. Perioperative crystalloid and colloid fluid management in children: where are we and how did we get here? Anesth Analg 2010;110:375-90. 29. Investigators SS, Australian, New Zealand Intensive Care Society Clinical Trials G, Australian Red Cross Blood S, George Institute for International H, Myburgh J, et al. Saline or albumin for fluid resuscitation in patients with traumatic brain injury. N Engl J Med 2007;357:874-84. 30. Morray JP, Geiduschek JM, Ramamoorthy C, Haberkern CM, Hackel A, Caplan RA, et al. Anesthesia-related cardiac arrest in children: initial findings of the Pediatric Perioperative Cardiac Arrest (POCA) Registry. Anesthesiology 2000;93:6-14. 31. Bosman GJ, Werre JM, Willekens FL, Novotny VM. Erythrocyte ageing in vivo and in vitro: structural aspects and implications for transfusion. Transfus Med 2008;18:335-47. 32. Dehmer JJ, Adamson WT. Massive transfusion and blood product use in the pediatric trauma patient. Semin Pediatr Surg 2010;19:286-91. 33. Kneyber MC, Hersi MI, Twisk JW, Markhorst DG, Plotz FB. Red blood cell transfusion in critically ill children is independently associated with increased mortality. Intensive Care Med 2007;33:1414-22. 34. Barcelona SL, Thompson AA, Cote CJ. Intraoperative pediatric blood transfusion therapy: A review of common issues. Part I: hematologic and physiologic differences from adults; metabolic and infectious risks. Paediatr Anaesth 2005;15:716-26.